These are real case studies and show the consequences to employees if there is inadequate health and safety in place. They also show that once a solution has been found, in addition to controlling the risk there can be other significant benefits for a company. The challenge was to develop a safety culture throughout the organisation to make the work environment safer by engaging all employees in the process of risk management. Safety participation is recorded by each employee in team meeting rooms and monitored daily by the team. Every month individual participation is converted to a percentage participation for the team, workshop and site. To ensure credibility, the site safety team carries out routine quality controls. Positive reinforcement of the importance of safety participation is provided by the role it plays in determining both individual and team remuneration. The graph shows that as safety participation has increased the number of accidents has significantly reduced. Although Michelin has several on-going safety initiatives, safety participation is the only one that guarantees an involvement on a monthly basis by all employees. Tyres are handled many times during manufacturing particularly in the finishing processes where they are inspected and tested. This requires the tyres to be lifted manually up to four times. 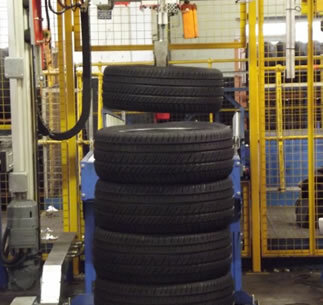 As Cooper’s Melksham plant began planning to move its production towards larger premium passenger and 4x4 tyres there was a concern that this could increase the potential risk of manual handling injuries, as individual employees can handle over 1,000 tyres per shift. The challenge then was to identify equipment to help reduce the manual handling. After inspection the tyres are sorted and stacked by size. Once there are sufficient stacks for a test run on the uniformity machines, the stacks are moved to the test machine. Here tyres were previously loaded manually onto the feed conveyor so this was identified as the best opportunity to introduce mechanical handling. Cooper contacted a mechanical handling company with its requirements and they, receiving guidance from Cooper from time to time, developed a prototype design for a 'tyre de-stacker'. The first machine was commissioned in 2011 and proved to be so effective that a second was purchased in 2013. The de-stackers have greatly reduced the amount of manual handling in the area and thereby, the risk of muscular skeletal injury. They are extremely reliable and efficient, with operatives able to pre-load them so they can be left running automatically. 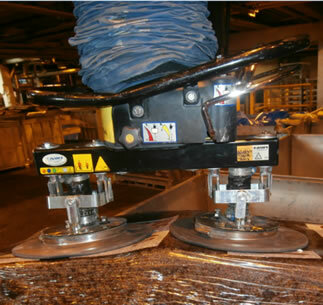 Bales of rubber are not of a uniformed shape and this prevented a standard vacuum lifter from being used to lift bales from storage units to the mixer belt. This was because an effective seal could not be achieved between the lifter and the bale. Workers therefore had to lift the bales manually, some of which were in excess of 25kg. MSD incidents associated with bale handling began to increase. Goodyear Dunlop discussed the problem with a manufacturer of vacuum handling equipment. This productive partnership resulted in the development of a twin headed flexible skirt vacuum lifter that could achieve a seal so solved the problem. The risk of any worker developing a MSD injury from bale handling was controlled. In addition, bales could now be handled more efficiently which helped improve productivity.